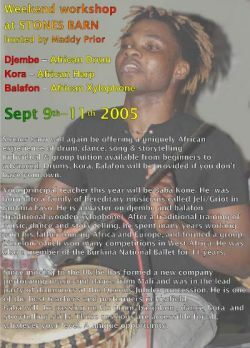 also a member of the Burkina National Ballet for 11 years. Maddy Prior is an exceptional host and her hospitality makes these weekends truly memorable. She runs an assortment of courses at her home in North East Cumbria, the largely undiscovered Border Region which straddles both England and Scotland. The folk here are warm and considerate of each other . It is a land of stark beauty. Of becks and fells. Of curlews, snipe and oyster-catchers. Of deer, otters and badgers. The course, which will be for about 12 people, is held in a superbly converted barn (it has under floor-heating). You are free to drum,dance and sing to your hearts content from midday on Friday until mid-afternoon on Sunday. There will be a get-together on Friday evening and performance on Saturday evening. Saturday will be a long day, with a candle-lit dinner in the evening. Each day will have mid-morning breaks, lunch and afternoon tea, of scrummy local fare and all included in the price. The courses will finish with a flourish on Sunday afternoon and all depart for home after a light meal. There is a range of local accommodation and space at Stones Barn for camper vans or camping. Early booking is advised. We can organise lifts for those coming by public transport and also help co-ordinate accommodation with any others in a like situation. The intention is to provide a friendly setting for small groups of like-minded people to learn and have fun with a subject they are interested in. There will be unique opportunities to tailor the programme to your own needs and experience new instruments.